Home/Advertising, Book marketing, Marketing, thought leadership/Do you want to grow your company? 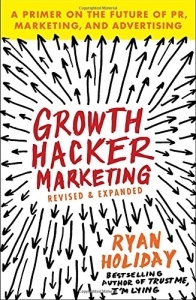 Growth hacking is a marketing technique developed by technology startups which use creativity, analytical thinking and social metrics to sell products and gain exposure. Growth hacking is all about trackable results. Results can be seen with tactics like pay per click ads, email, blogs and other tools that can be measured. It specifically excludes media like billboards. · Forget the mass market. Instead, go for the early adopters. B: One of the best things a company can do is to turn clients into evangelists. To do this, the client must be fully aware of the key services the company offers. · Dropbox gives extra space if you take a tour. The more the customer uses the service and knows about the service, the more they can tell friends. · Airbnb sends a photographer to take pictures. Everyone makes more money. This tactic is not scalable and it is expensive but it works for them. C. Companies can also turn clients into evangelists by incentivizing customers to refer friends by getting a product for free. For example Groupon says refer 3 friends and get something for free. Dropbox gives free space for referrals, which costs very little. Uber and Lyft give free rides for customers who tweet. Before you do this, find out how many new clients you need to cover the cost and be profitable.Finally, the key points of Growth Hacker Marketing is: test, track and scale. I like this concept because is adds accountability to the marketing. That’s why I’m a big fan of advertising on Facebook. You place an ad and you see results right away. I’ve run several campaigns for clients now and have seen what works to get prospects into the sales funnel. It’s actually fun to see the numbers get big! If you want more prospects, more leads and more results, check out my Facebook ad services at http://www.PRLEADStoPROFITS.com/Facebook and let’s set an appointment to see how to grow your company.